Looking for children's party ideas in Surrey? Make it a truly happy birthday with our top five budget birthday party suggestions for toddlers to 10-year-olds. It's the brain-racking dilemma most parents dread – arranging a birthday party for your little one that will a) amaze and excite b) keep parental stress-levels to a minimum and c) ensure every child returns to their family safe and happy! If, like most parents, you're feeling under pressure to come up with the ultimate birthday party to celebrate your child's special day, we've put together a guide to the best ideas on a budget. This children's party classic is perfect for entertaining children away from your own home and offering space for them to run around. The cost of hiring a local village hall makes this an affordable option. However, unless you're willing to provide the entertainment yourself, you may need to book a professional to ensure the event runs smoothly and everyone is occupied. Visit Surrey Mummy for a list of party entertainers covering a range of themes. If you're planning to keep things simple by hosting a small party at home, it's important to base it around a theme or activity to stop your little guests rampaging through the house. Pizza or cake-making parties are particularly popular, easy to arrange and also help with the catering too. The success of these options depends on good planning, so ensure you've measured out the ingredients for each guest before the party starts. Cakes and treats also make ideal party favours. If your children are summer babies, you could take a chance on the weather and arrange an outdoor party in a local park. Set up camp in one corner, take a big picnic, bring along some balls and rackets, and throw in a few Olympic-style games and your children will love the relaxed environment. A word of caution, however - you'll need a few extra pairs of hands to supervise the event. Here in Surrey, we're blessed with numerous great parks and outdoor spaces such as Priory Park in Reigate, Box Hill near Dorking, or Stoke Park in Guildford. Treat your little one to a trip to the cinema with friends, and enthral them with the bright lights and big screen. With a regular programme of family-friendly films, this is a firm favourite with kids of all ages. Bring along bags of popcorn and sweeties and sit back to watch the movie. This party can be organised independently or contact your local cinema to find out more about their party packages. Cineworld offers Movies for Juniors screenings at greatly discounted rates, perfect for a budget party. For the ultimate stress-free party, why not book a birthday celebration at our soft play centre? Sit back and watch your little one letting off steam with their friends in a safe and stimulating environment, while you enjoy a barista coffee from our café. 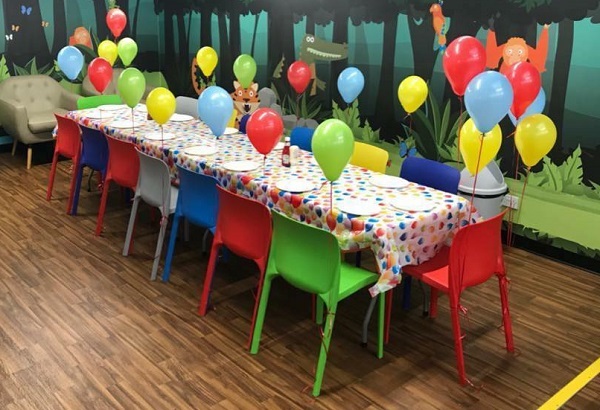 Our birthday party packages take care of everything – from a 2-hour party slot in our three-tiered soft play centre to party bags, tableware, thank you cards and even a throne for the birthday boy or girl. Available in bookable slots or for private hire, our affordable party packages cater for children aged 3 to 10 years. So treat them to a Lets Explore party for a birthday they'll never forget.